This beautiful 3 bedroom 2 bath condo with partial bay-views is in a very quiet and family friendly location, right on Sail Bay! Stroll on the sand along the shore or ride our 4 provided beach cruiser bicycles on the miles and miles of boardwalk along the bay and ocean. Sip wine on the balcony as you watch the sunset or walk around the bay 10 minutes to the ocean to watch for the green flash. At night you will see the two big paddle-wheel boats all lit up cruising in the bay, moonlight and lights of the strand across the bay reflecting off the water. This large, 1800 sq ft non-smoking 3 bedroom, 2 bathroom condo features a 50-inch flat screen TV with cable in the living room, DVD, a mounted TV in the Master Bedroom, a TV in the second bedroom with a built in DVD player for the kids, high speed cable internet, Wi-Fi and a desk to work comfortably on your laptop computer. The dining table seats 6. The Master bedroom has a king bed, there is a queen in the 2nd bedroom, bunk beds with a full on the bottom and a single on the top in the third bedroom and a queen sofa bed. There is an easy to use gas log fireplace for ambiance in the comfortable living room. The Master bathroom features dual sinks and an extra large exquisite tumbled travertine-tiled bath/shower area with a large oval soaking tub and extra large shower head. The 2nd bathroom also has tumbled travertine tile in the sink area and a full bath/shower. High quality 500 thread count Egyptian cotton linens and fluffy towels provided for your comfort. Beach towels, beach chairs and a beach umbrella are also provided. Coin op laundry room on each floor of building about 30 feet away. You can enjoy the view and sunset while cooking in the open California-style kitchen with all new appliances. Prepare meals in, if you like, as everything you need for cooking your own meals is provided. Trader Joe's is only a mile away and offers a wide variety of ready-to-heat-and-eat meals and gourmet salads, not to mention a fine selection of wines! Henry's (Wild Oats) Market, Von's and Ralph's are also close by as are a plethora of American, seafood and ethnic restaurants on the ocean and on the main street of Pacific Beach. The downtown Gas Lamp area with its wonderful upscale restaurants is only about 12 minutes away and Little Italy is about 10 minutes away. Sea World is 1 mile, Old Town where San Diego began, is about 3 miles, the famous San Diego Zoo and the Embarcadero with all it's floating museums and the ferry to Coronado Island are about 7 miles away. You can enjoy it all with your family on beautiful Sail Bay (the part of Mission Bay that is right next to the ocean). 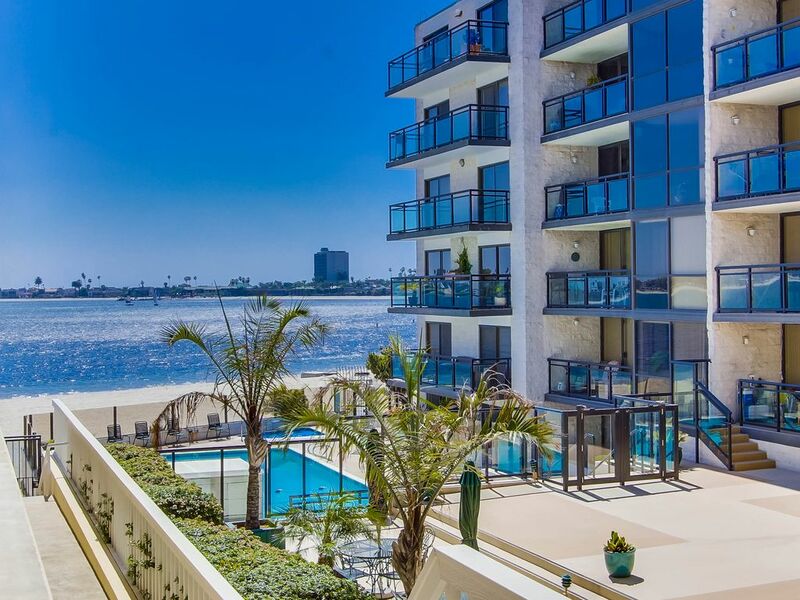 Whether you spend your days enjoying all that makes San Diego a world-renowned vacation destination or just relaxing with a book on the balcony or strolling on the sand, you will enjoy the casual atmosphere and perfect weather that makes San Diego so delightful. We strive to make your stay not only one you will long remember, but one you will long to return to, time and time again! ASK us if this unit has AC! The nearest sandy beach is just steps away. The ocean is a half mile away, easy walk. View from dining room and kitchen and small balcony with table and two chairs. High quality, minimum 300 thread count. shared with 4 units on same floor. If you have multiple loads you can use laundry rooms on other floors. Two parking places in the secure underground parking garage. elevator goes up to each of 4 floors from underground garage. There are 3 TVs, one in Livingroom, one in Master bedroom and one in kids bunkbed room. There are two. One in Living room and one in Kids bedroom (built in to TV). Amazingly huge library of DVD movies for both kids and adults! Clean spacious condo with plenty to do. The location makes this condo a five star stay. Three generations of our family traveling together on holiday were well served by the accommodations and the accommodating folks at Nancy's Vacation Rentals. There were a few minor difficulties which were handled efficiently and quickly by a very helpful staff. The location was perfect for our needs and the apartment itself gave each member of our family group privacy as well as utility needed in terms of kitchen and storage to do things in an economical fashion. The off street parking, beach stuff and bicycles were a definite plus. A great time together in a venue that I would use again without hesitation. Terrific location - easy to get everywhere, EXCELLENT communication from rental office, incredibly easy beach access. Neighborhood felt lively but never crowded. Kitchen is very well-equipped, which worked so well for our family breakfasts and dinners. Thanks for the feedback. We are thrilled you enjoyed your stay. It sounds like you had a 5 star vacation, not a 4 star. We invite you to stay with us again. They were very quick if called about anything we needed from the owners. Very friendly staff. Would rent from them again In the future. Thanks for the feedback. Please stay with us again. Seven of us came for a birthday celebration. We felt the location was excellent. The picture on the website was deceiving showing a pool. Why show the pool (which is not part of the building) when there is a good view of the place from the beach? The space was nice, clean, easy directions, comfy beds, good water pressure. Everyone liked the place and said they would stay there again. There is a wonderful young children's playground right on Sail Bay about 200 yards down the boardwalk. We provide 4 adult beach cruiser bicycles for riding on the miles and miles of boardwalk around Mission Bay and all along the ocean. Great area for walking, too! Maybe you'll catch a glimpse of the green flash just as the sun sets on the ocean on cloudless days.